The fulltime EMT hired by Southern Trinity Area Rescue for weekend relief through the use of Measure Z funds has been covering 40 hours a week since the first week of October 2017. While still expecting low volunteer staffing numbers, do to this position we have been able to continue to staff the ambulance fulltime and provide emergency medical care to the communities in eastern Humboldt and southern Trinity counties. A long term goal for STAR is to have two fulltime EMTs to staff the ambulance on weekends to remain fully operational. Through Measure Z funds STAR was able to hire a second temporary fulltime EMT who started the 1st of May 2018 and will work until the end of June, with the hope of making the position permanent for the next 2018-19 year. An added positive effect of hiring our weekend EMTs, funded by Measure Z, is the wonderful initiative they have taken to improve and maintain STAR equipment. Previously we had very little staff to maintain equipment, weekly inventories, and inspections. Although these tasks were done in the past, it was an extra burden to the already overworked volunteers. Our new paid EMT not only have taken on these tasks but are going above and beyond to improve STAR operations. The volunteers and the local community are excited about the new energy that had been brought into STAR by these staffing improvements. The fulltime EMT hired by Southern Trinity Area Rescue for weekend relief through the use of Measure Z funds has been covering 40 hours a week since the first week of October 2017. While still experiencing critically low volunteer staffing numbers, do to this position we have been able to continue to staff the ambulance full time and provide Emergency Medical Care to the communities in Eastern Humboldt and Southern Trinity counties. 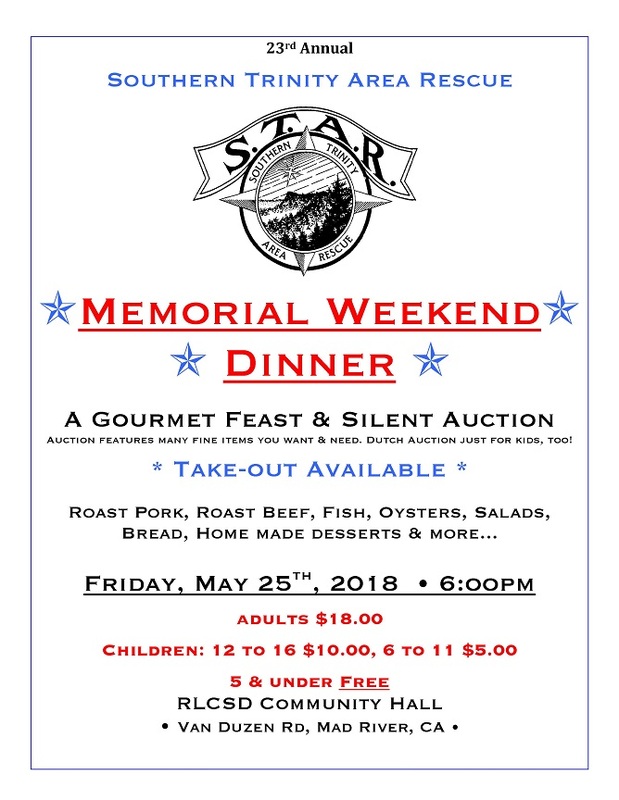 The volunteers of STAR have expressed relief and gratefulness along with renewed excitement about what they do for STAR due to having this weekend relief to give them time with their families. The community, as well as people passing through, continues to be grateful to have an ambulance service that otherwise they would not have in such a remote area. An added positive affect of hiring our weekend EMT, funded by Measure Z, is the wonderful initiative they have taken to improve and maintain STAR equipment. Previously we had very little staff to maintain weekly inventories and checks. Although these tasks were done in the past it was an extra burden to already overworked volunteers. Our new paid EMT not only has taken on these tasks but is going above and beyond in improving STAR operations. Using the funds granted through Measure Z to Southern Trinity Area Rescue (STAR), we were able to advertise, recruit, and hire a full time EMT to provide relief for our shortage of volunteer staff on the weekends. Now, with this full time staffed position we will be able to continue to provide 24 hour 911 ambulance services to the eastern Humboldt/ southern Trinity area that STAR covers, as well as give some much needed relief to our small group of volunteers that staff the ambulance. When applying for measure Z funding this past spring our volunteer ambulance staff was at a critical low point and we were looking at being unable to keep a year round ambulance service operational in our area. Having this paid staff position, funded by Measure Z, has insured continued ambulance coverage for our communities were the nearest hospital is 1 to 3 hour away. An added positive effect of putting these funds to use was the boost in moral it gave our current volunteer base. The staffing relief, as well as being recognized as a critical organization in our counties health and safety system has made our volunteers feel what they do is important and appreciated. For More information on Measure Z, visit the Humboldt County Website here.